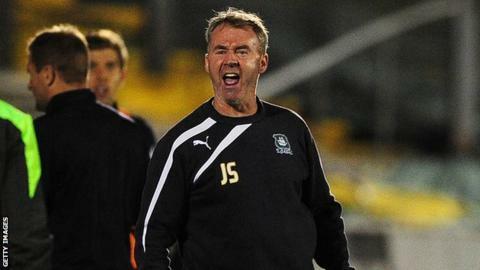 Plymouth Argyle boss John Sheridan is impressed the way his side are playing, even though they have only taken one point for their last two games. Argyle conceded late on to on Saturday after the week before. "Our level of performance has improved a lot. We've just got to try and pick points up," Sheridan told BBC Devon. "Performance-wise, if we just keep those standards up, I think we'll win a lot of games at home," he added. Argyle had gone seven games unbeaten in League Two before losing at Mansfield, and despite their slight dip in form, are still fifth in League Two. "There's no qualms in the way we played, we did everything right to see the game through," Sheridan said. "If we'd have won the game 1-0 I'd have been talking about some top-drawer performances. I thought Andy Kellett was superb, Bobby Reid was superb, Kelvin Mellor was superb and us, as a team, were superb."